Check out this great Spec Ad created by Miami Ad School students and Burger King's CCOs Fernando Machado and Anselmo Ramos. At Burger King everything is better with fire... Our research showed that fire is so relaxing that more than 30 Million people watch relaxing fire YouTube videos! 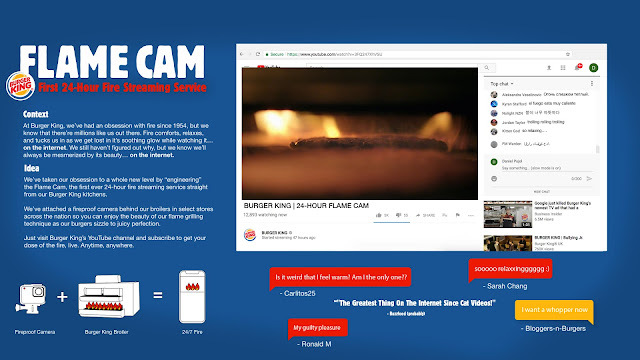 That is why we created the FLAME CAM, 24/7 Live stream video, straight from the broilers of our stores. Check it Out! Advertising Agency: Name, City, Country Miami Ad School, Miami, United States.